Today, we’ll explore one of the enterprise behemoths, both in market cap and average revenue per customer: WorkDay. WorkDay envisions being the place of record for all Human Resources data for companies with more than 5,000 employees. 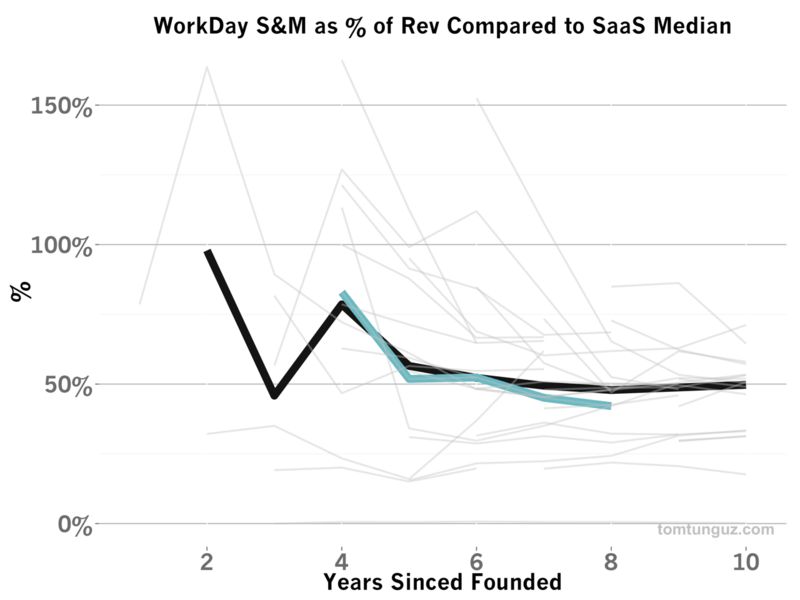 WorkDay has grown explosively, but in a very different manner than any of the previous companies we’ve analyzed (Veeva, Hubspot, Zendesk, Tableau, MobileIron or Box). Unlike these other companies, WorkDay has employed a huge professional services team in addition in investing massively in their R&D to create a broad suite of products. 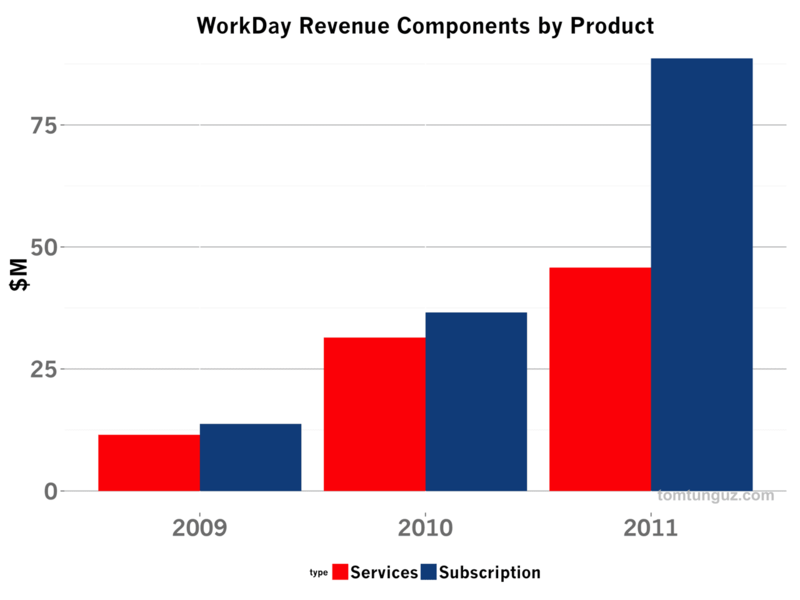 Just how significant is the professional services component to WorkDay’s business? In 2009 and 2010, the company recognized more revenue from services than subscription. Over time, that figure has fallen, but it far surpasses any of the SaaS companies we’ve analyzed to date. In 2011, the year of the IPO, services still accounted for 33% of revenues. Over time, subscription revenue will continue to increase compared to services revenue. WorkDay deploys its professional services teams at the outset of a customer’s engagement with WorkDay when all the systems integration and data processing must be completed. It’s a critical component to customer success But this involvement decreases with time and tends to be episodic, as does the revenue WorkDay generates from it. In contrast, WorkDay typically signs 3-5 subscription year agreements, so the subscription revenue is a substantial annuity of long duration. Nevertheless, Services revenue will be a significant contributor to revenue for the foreseeable future, because new accounts are the biggest driver for revenue growth, according to the S-1. Over the past decade, software companies have been advised to limit their services revenue to typically less than 20% of total revenues, counsel which WorkDay has ignored to their great success. Behind this advice is some sage advice, however. Services revenue isn’t a money-maker. 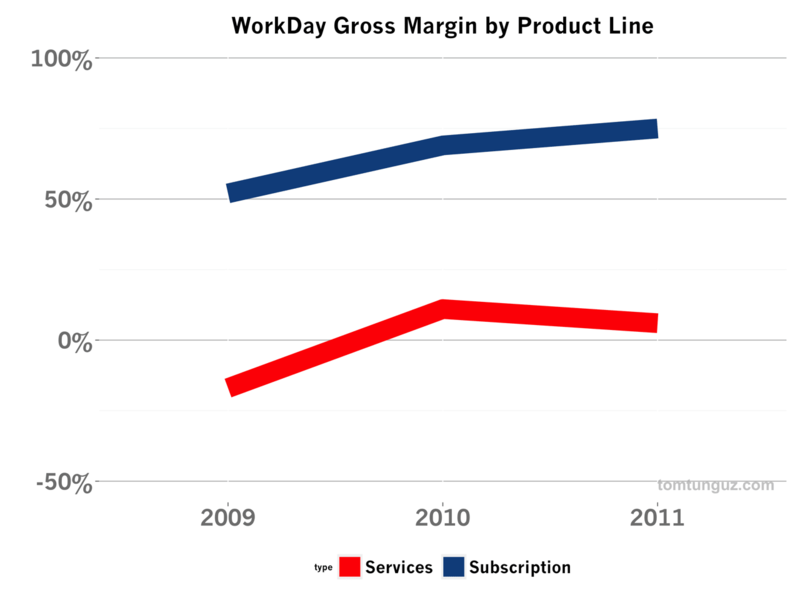 WorkDay has operated its Services group at a loss or close to break-even for the three years we have data. The chart above shows these trends and compares it to the Subscription gross margin which has increased by 50%, reaching 75% in 2011, in the same time period. Selling people’s time can’t be leveraged like software. In addition to developing the flagship Human Capital Management application, WorkDay has been building a suite of complementary tools including Financial Management, Procurement & Expenses, Payroll, and Talent Management at the pace of about one product per year. 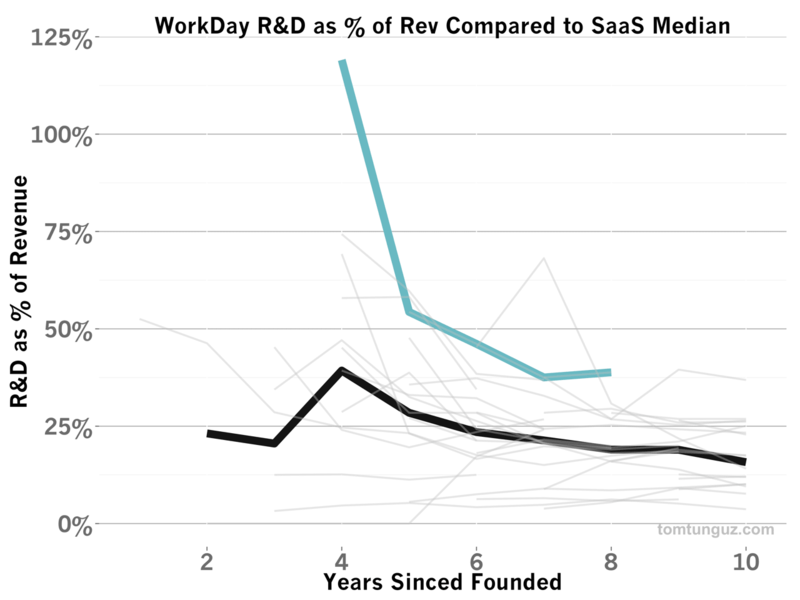 To achieve this enormous product breadth, WorkDay spent an astounding 119% of revenue on R&D, more than any other SaaS company at their stage. In dollars, WorkDay $30M on research & development on revenues of $25.2M in 2009. WorkDay financed this huge investment by coupling long-term, near-million-dollar agreements and nearly $200M in venture capital. The sum total of all this investment in engineering and professional services enabled by big contracts and venture capital is immense revenue growth, more than tripling revenues in just two years, in addition to more than $150M in deferred revenue. 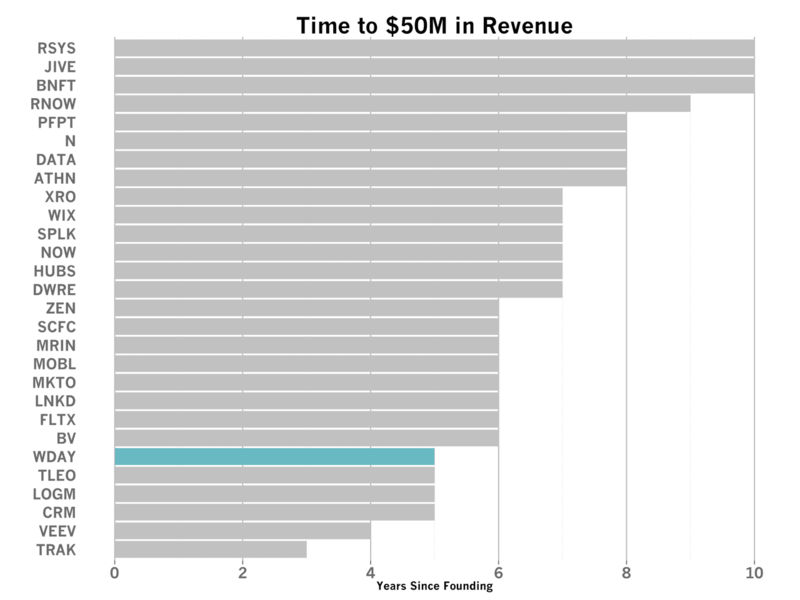 WorkDay reached $50M just five years after founding, tying it for third fastest to $50M among the public SaaS companies in this bucket. 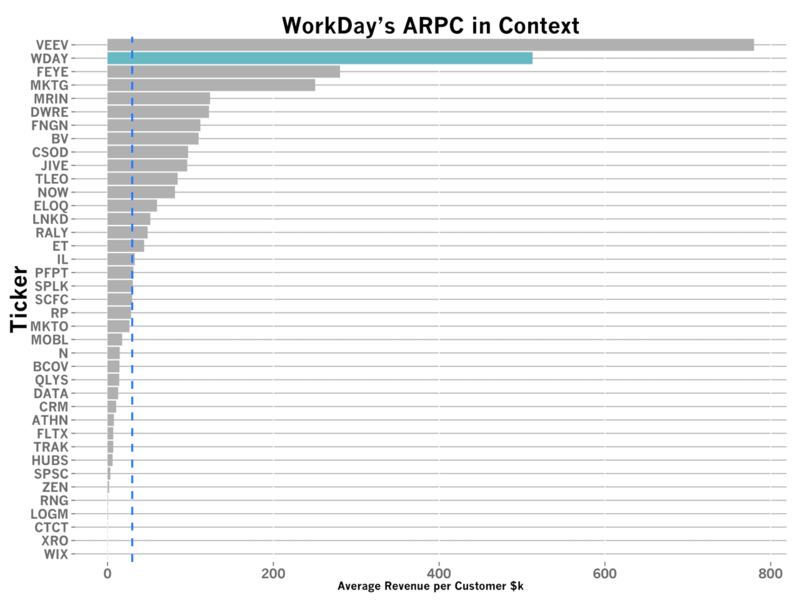 With only 325 customers at IPO, WorkDay’s revenues are driven by a $500k+ Average Revenue per Customer, second only to Veeva. This figure includes both subscription and service, but is annualized, so the total contract values (TCV) are substantially larger, at least 3-5x. 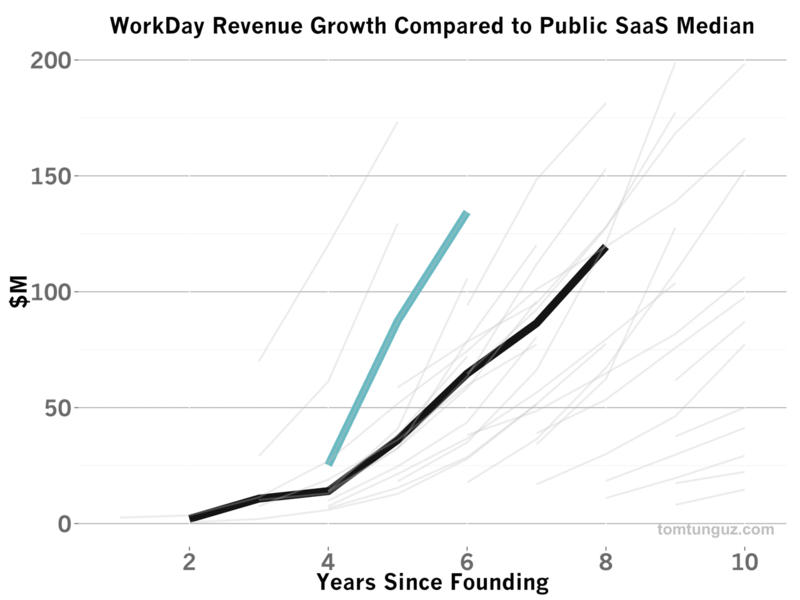 Despite that huge revenue growth, WorkDay has the median amount on Sales and Marketing as a percentage of revenue. 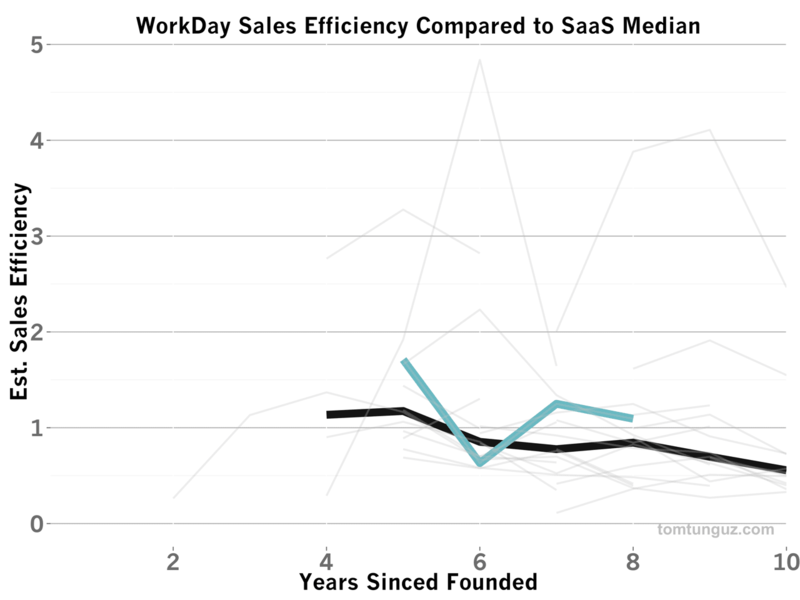 And WorkDay’s sales efficiency is also at or better than the median, likely because the contract sizes are so large, they support significant investment in sales and marketing. 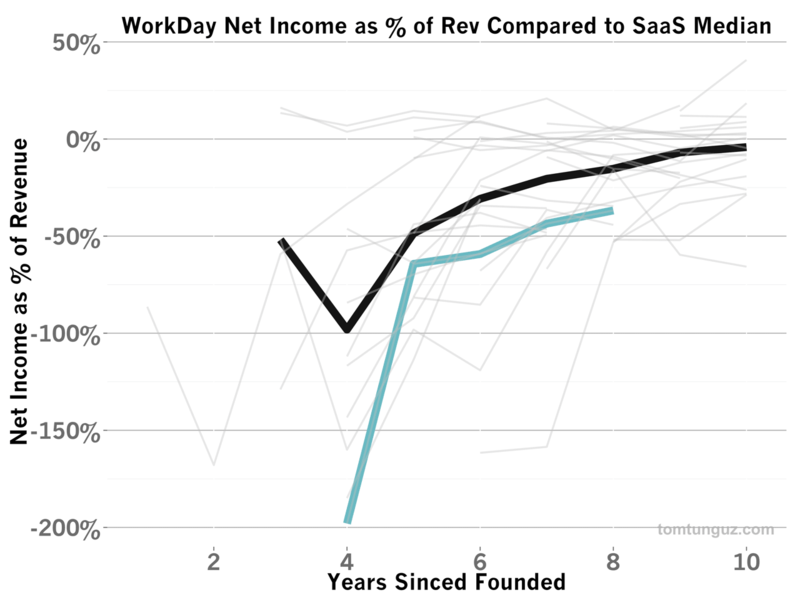 Because of all the R&D spend, WorkDay’s net income percentage is substantially lower than the median. But because the company has such a huge amount of deferred revenue, the possibility of cross-selling the product suite and lengthy customer lifetimes, it’s easy to justify this continued spend. WorkDay has built a business in a very different manner than most SaaS companies, leveraging large contracts, massive R&D spend and substantial professional services engagements to generate massive revenue growth and create the next monolithic enterprise company.